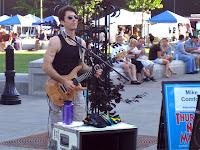 Mike, Brandon and I played on 4th Street during Thursday's Farmer's Market. We played considerably louder than any other street band I've seen during the city-sponsored events. No one complained. In fact, we had a surprisingly large audience, and quite a bit of cash in the guitar case afterward, which we spent on beer and Mexican food. Fun! I would love to post photos and video of our gig at LaSalles on May 2, but I can't. The boss said no-no until he gets back to "fighting weight" and we can shoot some quality footage with the Butte College team. OKfinewhatever. I'll just say that the gig was a blast, and I can't wait to do it again. Yes, yes, ladies and headbangers, Friday is the night! Entertainment! Peril! Luminescence! My debut in Mike Comfort. Can you tell I'm excited? "Wait, haven't you played twice already?" you say, not missing a thing. Uh, yes. And no. Our first gig was a warm up, with a substitute bass player in a bar with a sick singer and no sound check. The second was "unplugged," with no bass or drums at all. So this gig really is the one, with a cherry on top. We're at LaSalles, 10pm. Chico's "biggest" small club. Smallest big club, whatever. Smells delightfully of stale beer, year round. Good soundsystem. Fits a couple hundred college kids. Mike's band has a decidedly grown up set of fans, too. I have no idea how many people will be there. But there's a small herd coming for me! You guys rock! My fingernail has about had it. 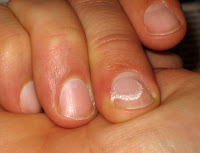 120 hours in 12 weeks evidently is enough to rub away my nail. Rock and roll, baby.